United Airlines CEO Oscar Munoz in June 2016. He is appearing before a House committee today. The CEO of United Airlines is in the hot seat on Capitol Hill this morning, answering pointed questions from members of Congress about last month's incident in which a United passenger was dragged off a plane. 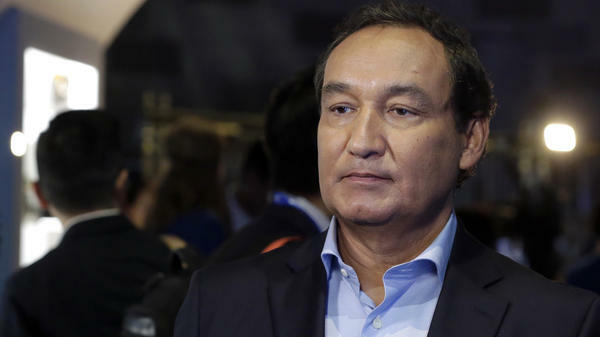 "It was a mistake of epic proportions," United CEO Oscar Munoz told representatives, as he explained how United has changed its rules moving forward. "In hindsight, clearly our policies broke down." Executives from other airlines are there, too, as Congress examines customer service problems across the commercial aviation industry and considers legislation to better protect airline passengers. "It's shameful that an event like the one that we had at United needs to drive this conversation," Munoz said. Munoz is appearing before the House Transportation Committee, along with the airline's president, Scott Kirby, to try to explain why the airline needed to bump passengers from a flight heading to Louisville, Ky., from Chicago after they'd already been seated, and why United called on O'Hare airport security officers to remove the passenger who refused to give up his seat. Cellphone video shows the officers violently pulling 69-year-old Dr. David Dao of Kentucky out of his seat and then dragging him up the aisle and off the plane. Dao suffered a concussion and a broken nose and lost two teeth. His attorney says he may need surgery because of his injuries. Dao reached a settlement with United last week for an undisclosed amount. Munoz has apologized repeatedly for the incident and for his own initial response, which was criticized as tone deaf when he apologized for having to "re-accommodate" the passenger. Last week, the airline announced several policy changes to prevent such incidents from happening again. One change is that United will reduce over-booking of flights in order to limit the need to "bump" passengers to a later flight. When it does overbook, United will now offer up to $10,000 to passengers who volunteer to be bumped. The intention is to limit the need to involuntarily bump passengers, as happened in the April 9 dragging incident. United also says that the airline will no longer call on airport police or other law enforcement personnel to handle these kinds of matters, unless safety and security are at risk. Philipovitch apologized for a recent incident on American Airlines on April 21 in which a flight attendant and a passenger clashed over a stroller. "It's important for American to take responsibility when we don't handle things well," she said. "There's no question that we can do better." Congress is considering legislation to better protect airline passengers. The BOARD (Bumping on Overbooked Airplanes Requires Dealing) Fairly act, introduced by Chicago-area Democratic Rep. Jan Schakowsky, which would prohibit airlines from bumping passengers against their will, ever. The SEAT (Secure Equity in Airline Transportation) Act, which would prevent airlines from removing a customer from his or her seat to make room for another passenger or an airline employee, introduced by Republican Rep. Neal Dunn of Florida. The "Customers, Not Cargo" Act, which would also prohibit airlines from bumping passengers from overbooked flights after they're seated on the plane, introduced by Sen. Chris Van Hollen, D-Md. The TICKETS (Transparency, Improvements and Compensation to Keep Every Ticketholder Safe) Act, proposed by Democratic Sens. Maggie Hassan of New Hampshire and Brian Schatz of Hawaii, which in addition to prohibiting airlines from bumping passengers who have already boarded, would also lift the federal cap on the amount of compensation airlines have to pay bumped passengers. The Passenger Bill of Rights, which was introduced last year by Sen. Richard Blumenthal, D-Ct. It would expand and update the "Passenger Bill or Rights" implemented by the Department of Transportation during the Obama administration. Senators will have a chance to grill the airline executives in another hearing scheduled for Thursday. In addition to United executives, Chicago Aviation Commissioner Ginger Evans, who oversees O'Hare and Midway airports, will appear to testify to explain the actions of her department's security officers, who dragged Dao off the plane. The CEO of United Airlines is apologizing again for the violent removal of a passenger who was dragged off a plane last month. OSCAR MUNOZ: We had a horrible failure three weeks ago. It is not who we are. It is not this company. I mean, frankly, it is not this industry. SIEGEL: That mea culpa came at a hearing today held by the House Transportation Committee. Oscar Munoz and other airline executives were grilled about persistent customer service problems. NPR's David Schaper reports. DAVID SCHAPER, BYLINE: Transportation Committee Chairman Bill Shuster wasted no time in setting an almost scolding tone, promising it would not be a pleasant hearing for United CEO Oscar Munoz and the other airline executives sitting before him. BILL SHUSTER: There's something clearly broken when we see passengers being treated the way some of them have been treated in recent flights. Regardless of the contractual relationship between the airline and the ticket holder, it's just common decency and common sense that you don't treat a person that way, let alone a paying customer. SCHAPER: Shuster says after the dragging incident on United and another incident on American Airlines in which a woman with a stroller was removed from a flight, the airline bosses owe the flying public some answers. SHUSTER: This issue is not going away, and we're not going away. We will hold you accountable, and we expect real results. SCHAPER: Munoz again apologized for the incident in which United passenger David Dao, a 69-year-old doctor from Kentucky, was pulled out of his seat by O'Hare airport security officers and dragged up the aisle and off the plane after refusing to be involuntarily bumped from the Louisville-bound flight to accommodate United crew members needed to work a flight the next day. Munoz calls the entire episode a mistake of epic proportions. MUNOZ: Unless safety or security are - is an issue, we will never again ask a customer to give up their seat once they're on board - simple common sense - or ask law enforcement to remove a customer from a flight. SCHAPER: Munoz says United will now reduce overbooking of flights. And when it does need to bump passengers, it will now offer up to $10,000 in compensation in hopes of getting more volunteers. Other airlines are changing their policies too. Southwest, for example, says it will end the practice of overbooking flights altogether, but that's hardly the only problem people have with airlines. Committee members complained about long lines, smaller seats with less room between them and fees for more leg room, checked bags and every other little thing at a time profits for the industry are soaring. William McGee of the Consumers Union told the committee that poor customer service is a product of airline consolidation, less competition and cost-cutting measures like outsourcing. WILLIAM MCGEE: I'm not sure that many passengers are even aware that when they check in or when they are speaking to a customer service agent, in fact in many cases, they're wearing a uniform of an airline; they have a name tag from an airline, but they're outsourced. SCHAPER: Several committee members are calling on the airlines to make changes on their own before Congress forces them to. Again, Republican Transportation Committee Chairman Bill Shuster. SHUSTER: If we don't see meaningful results that improve customer service the next time this committee meets to address the issue, I can assure you, you won't like the outcome. SCHAPER: Such a move would run counter to the Trump administration's promises to reduce industry regulations. But there are already close to half a dozen bills introduced that would prohibit airlines from forcing passengers to give up their seats and add new consumer protections. David Schaper, NPR News. Transcript provided by NPR, Copyright NPR.